Here is a puzzle: Where can you stand on dry ground and look up to see a river channel above you? Ok, yes, New Orleans is a good answer. But I’m talking about looking up 100 feet from a non man-made location. Actually there are quite a few places on Earth and possibly on Mars. But I am not talking about river channels with flowing water. I am talking about “fossil” river channels. A bit of a trick question, but a really cool geological phenomena nonetheless. Let me introduce you to fossil riverbeds and in this case a special type of fossil riverbed called an inverted paelochannel. To do so we are going to have to travel back to Utah once again. Google screenshot of area south of Green River UT. I have highlighted some of the “fossil” rivers from the area. Below I show closer shots of these ancient rivers. The green colored river to the right is the Green River:-) as it currently flows today. Google and Google logo and registered trademarks of Google Inc. and used with permission. Above we see a satellite image of the desert region south of Green River in south central Utah. To the right is the snaking Green River as it has eroded a deep channel into the red sandstone rock. What I have outlined in this image are just some of the “fossil” rivers in the area. These are fossil rivers or what have been called preserved paleochannels or gravel-capped ridges because they are hard rock that represent the solidified remains of ancient riverbeds. What you might find most shocking about these preserved rivers is that what I have outlined are actually the highest elevations on the image. These rivers are raised up 100 feet or more above all their surroundings. Because they appear as raised ridges they have been called inverted paleochannels. Let look a bit closer so you can see what I am talking about. 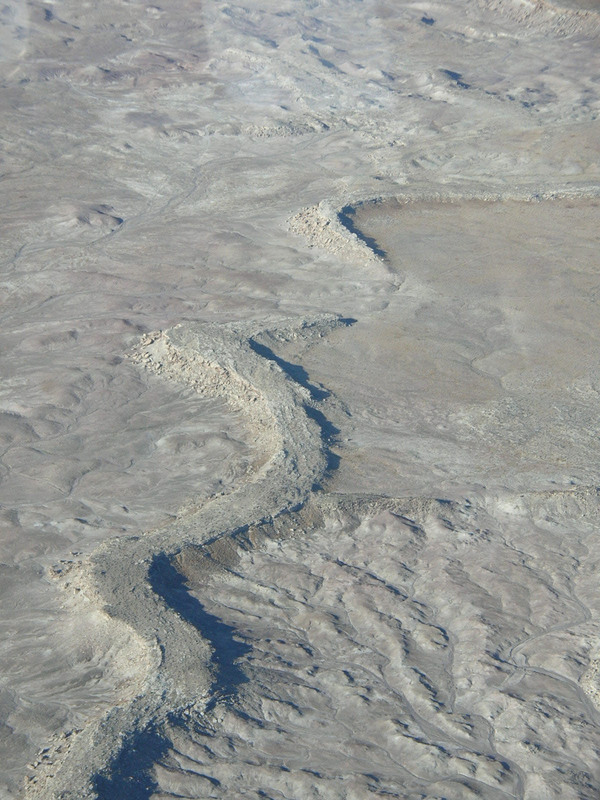 Screenshot of the area southwest of Green River UT where ancient remnants of rivers are found. These are called paleochannels. I have added a maroon line to indicate where this ancient river once ran. Google and Google logo and registered trademarks of Google Inc. and used with permission. Above is a closer look at one section just a few miles long of an ancient river bed. You might be able to tell that the river is actually not in a valley but is rather the exact opposite. The river represents the highest elevations and the ground slopes away from the riverbed. I understand this seems very counter intuitive but these river beds really are higher than their surroundings. Now look at the picture to the right. You can clearly see that these sinuous ridges are just that, ridges and not valleys. While this looks like a winding river you would not be expected to believe these are the remains of rivers just looking at them. But close inspection of the rocks themselves reveals all the characteristics of an ancient river. These ridges are caused by a hard cap rock that resists erosion. That rock is made from cemented gravel and sand that shows all the signs of having been the bed of an ancient river system. That material in the river bed became much harder rock that the layers below or to each side and so much later when the entire area was eroded the rock of the ancient river bed resisted that erosion. Inverted/raised paleochannel as seen on Google maps. in this close-up you can see the hardened rocks of what used to be the stream channel that are now about 100 feet above the surrounding landscape. Google and the Google logo are registered trademarks of Google Inc. and used with permission. Above is an even closer view at a portion of this inverted river channel. In this case an intermittent creek has eroded a path through the ridge. You can see the large slabs of erosion resistant rock (about 100 feet above the surrounding area) that have fallen from the ridge of hard rock. These are all conglomerate rocks made of cemented stones laid down in a riverbed. Another close-up satellite view of the paleochannel in Utah. Google and the Google logo are registered trademarks of Google Inc. and used with permission. Another closeup of a thin ridge of rock that again represents what was the bottom of a river at some point in the past. Here you can see that the hard cap rock of this ridge has crumbled to the point where there are now gaps and the underlying material that is not as resistant to erosion is now being eroded albeit very very slowly in this desert environment. So what is the proposed origin of these fossil riverbeds? 1) Long ago in the Jurassic this region was low lying land with gentle hills and dinosaurs roamed the area as evidenced by the many dinosaur bones in the area. Winding rivers would have run among the hills creating the channels we see today. 2) Later, a warming globe melted the ice at the poles along with other changes in the ocean floor flooding the entire region. Eventually several thousand feet of sediments were deposited over the whole region as the land sank. This buried the river valleys with sediments. and over time what had been the gravel river bottoms solidified into very hard rock made of cemented stones. 3) When the earth cooled the entire area dried out and began to erode. Eventually thousands of feet of rock eroded from this whole area. When that downward erosion reached the level where these ancient rivers were the rock was resistant while what were the hills next to the rivers where not as resistant and so continued to erode. Eventually the latter eroded down further than where the river used to be. As a result what was the bottom of the rivers are now found more than 100 feet above most of the surrounding area. This is why the channels have been referred to as being “exhumed.” They have been exhumed from a state of burial for millions of years and brought back to the surface. This process might be very difficult to image so let’s try a simpler example. Lets say we dug a foundation in a flat area of deep soil and poured concrete footers for a home. Later that home is destroyed by a flood that drags the house away and covers the area with some more sediment. If over the next 50 years streams erode the ground in that area eventually the footers will be revealed (exhumed to the surface) and with enough erosion will find themselves sitting above the surface because they are more resistant to erosion than the soil around them. Likewise the riverbeds long ago became like a layer of cement in the valley floors and later when everything around them eroded they have found themselves sitting above all of their surroundings. Inverted channels are not just a feature found here on Earth. It appears that there are similar raised channels on Mars. Below is an image from Mars of what appears to be the remnants of ancient stream channels. What you can’t tell from this image is that the meandering branching pattern you see are not channels eroded into the surface of Mars but are actually ridges and so represent higher elevation than the surrounding landscape. If these are fossil stream beds then these may have a similar history. On Earth we can explain the erosion of the material that buried these rivers as erosion by water but on Mars, these ancient fossil rivers must have been exposed as ridges as the result of wind as the erosive agent. As slow as the process of eroding thousands of feet of rock on earth would be by fluvial processes, wind erosion on Mars of features such as this are thought to have taken a half a billion years or more. 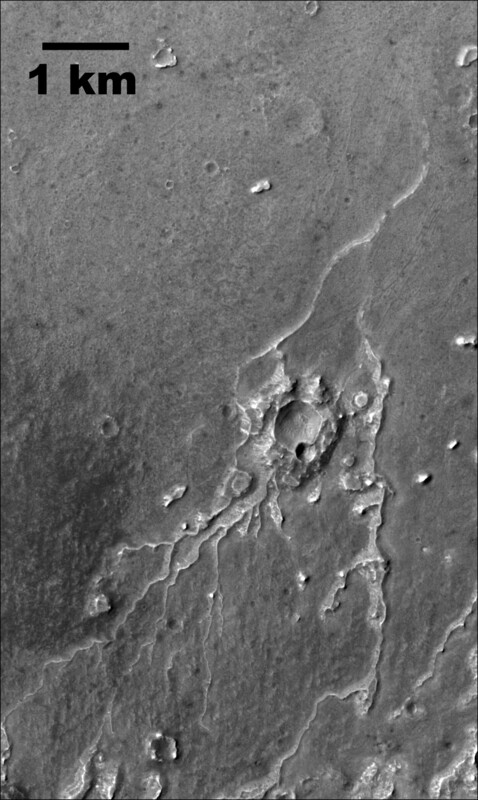 An inverted ancient river on Mars? Subscene of CTX image P01_001377_1887_XN_08N076W_061111 of branching ridge network located on Lunae Planum. The dendritic pattern, low junction angles, as well as the number and spacing of low order tributaries are all evidence of a fluvial origin to the landform.. Thanks for sharing, very interesting. Recently discovered your blog via geochristian and really enjoying it, cheers!